Session 3 - The How, What, When, and Why of Mental Health: Is it Possible To Become Lastingly Happier and, If Yes, How? Session 10 - Happiness in a Global Workplace – Culture in your Heart or on your Back? Finally we have our photos uploaded – enjoy!! We are so thankful to all of you who helped make the 1st Asian New Science of Happiness and Well-Being Conference such a success. After much planning and long days we had a full house of 250 people – people from all walks of life – parents, executives, health workers, government officers, prison officers, police officers, psychologists, university lecturers, coaches to name just a few. It was such a privilege to have as guest of honour Minister in the Prime Minister’s office Mr. Lim Boon Heng who shared many insights on what happiness means for Singaporeans and talked about the Governments commitment to ensuring that the conditions and policies are in place for people of all walks of life to be happy. 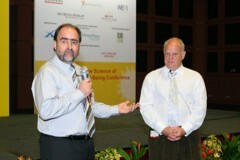 Despite his busy schedule Mr.Lim was kind enough to stay with us to hear the session from Dr. Martin Seligman. As one of the founders of positive psychology Dr. Seligman has done more than most to spread the good news from happiness research – that all can choose to be happy by focusing on some simple things. The three types of happiness stemming from positive psychology research were shared - Positive Emotion – “the pleasant life”; Positive Character – “the engaged life; Positive Institutions – “the meaningful life”. 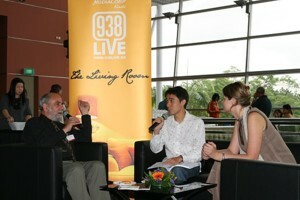 Of special interest was Dr. Seligman’s suggestion that Singapore could lead in ensuring the happiness of its citizens. Likening Singapore to Florence of the middle ages – he said that having secured economic development Singapore could focus on well-being beyond material wealth. The conference progressed with wonderful contributions from our experts who spoke on health, education, literature, policy, culture and laughter - the audience was given a virtual “smorgasbord” of latest thinking on happiness and positive psychology. Focusing on in-depth of analysis leading global experts shared their thoughts. PROFESSOR DAVID CHAN – truly engaged all of us with a wonderful and expert analysis of happiness and well-being and the Singapore context. The audience really appreciated his wide experience and his ability to make positive psychology research alive and practical. He left us wanting more! 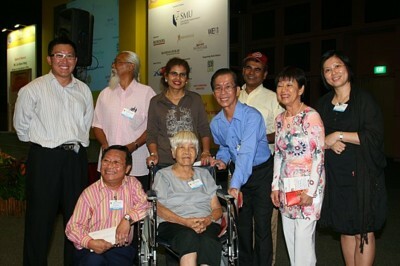 Without doubt a highlight of the 2 days was the announcement of Singapore’s happiest person award. 200 participants were nominated by friends, colleagues and family members, which was whittled down to a group of 16 short list. The top four were announced before the conference and the winner was announced as the last event of the conference. John Bittleston of Terrific Mentors was emcee and generously donated $200 for each of the 15 finalists. We were lucky to have had incredible press coverage – by the end of the event, the conference and search were covered 60 times in the local press/TV/Radio – not to mention coverage all over the world. The search and conference were picked up from Germany to South Africa to New Zealand to Uzbekistan to India and many other countries. Finally a great big thanks to all of our staff and helpers at Global Leadership Academy – Rachel Ang, Deborah Eeh, Manuela Estante, Marian Lin Sheng, Tan Siew Lan, and Marnie Vergara – whose hard work and dedication made this possible.